Another cake with just about everything thrown at it; cake board iced, etched and painted to look like wooden boards, bottom cake was sprayed with edible lustre and airbrushed with colours to give a sort of battered look (! 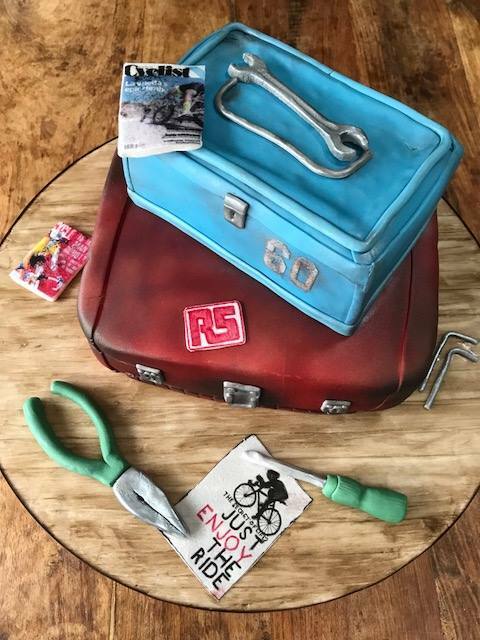 ), top cake iced in blue fondant and painted with edible lustres to distress it, fondant pliers, screwdriver and allen keys, and hand drawn logos and poster in edible ink onto rice paper, 2 cycling magazines images printed onto rice paper. BOOM!